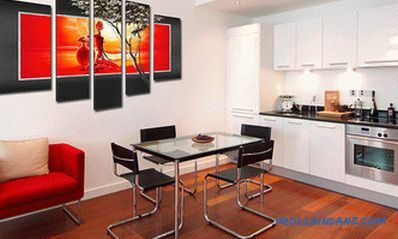 Using modular paintings in the interior of an apartment or office is not only fashionable, but also practical. First, the modules perform the function of an art object that fills the room with an aesthetic sense, making its design individual and memorable. Secondly, modular images solve the issue of decorating an empty wall, as they consist of several panels and occupy a large area. Their main difference from ordinary pictures is that all the segments are separate canvases that are united by one plot, idea, style or theme. 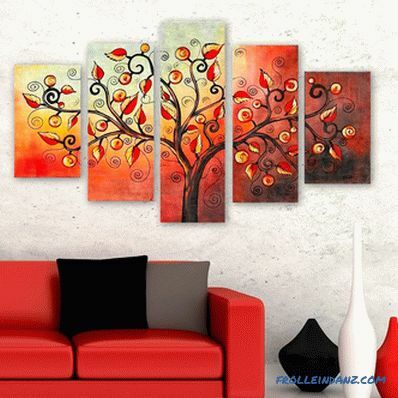 Modular paintings in the interior of a living room, bedroom or another room are an object of art consisting of several segments. If you connect them together, you can get a complete picture. Such images are conventionally divided by the number of segments, by their size and by the method of location on the surface. Depending on how many segments a web is divided into, it is called a diptych, triptych, pentatech or polyptych. A diptych consists of only two modules . It is well suited for small rooms, as it occupies a minimum of space, and at the same time successfully decorates the room. 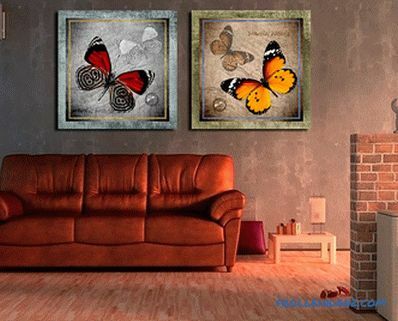 Butterflies diptych in a small living room. A triptych consists of three modules . 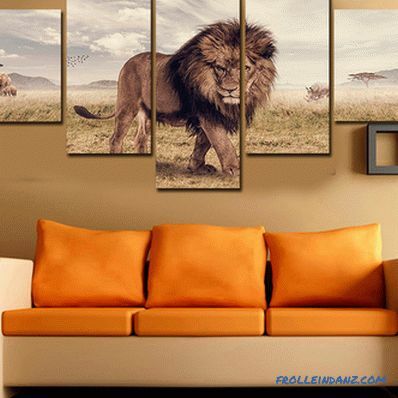 Depending on the size of the modules and the method of their location, the picture may be suitable for the decor of a bedroom, corridor or another room of medium size. "Buddha" in the interior of the corridor. A polyptych may consist of four, five, or more modules. 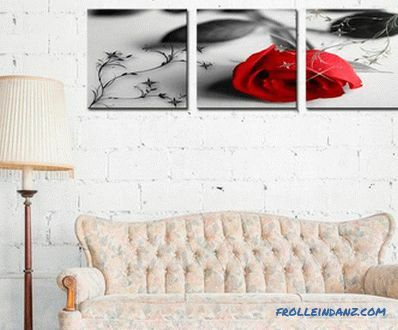 Such modular pictures look good in the interior of the living room, office, or hall. They require a lot of space. Polyptych "At the Berth", consisting of four parts. Pentatech consists of five segments, it belongs to the category of polyptychs. The Pentatech "Africa" ​​fills the room space with an ethnic spirit. To understand how to choose a modular picture for the interior, you need to know the size of the room and its features. 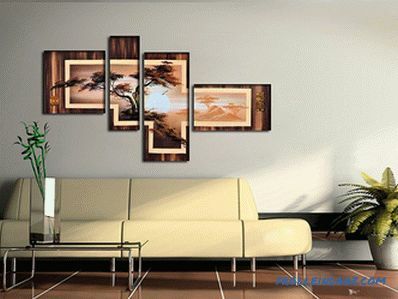 If you buy a triptych from narrow vertical modules in a narrow room with high ceilings, it will make the proportions of the room even more wrong. But equilateral modules of the same size will work well in such a room. For a spacious room with high ceilings, you can choose modules of different sizes - both large and small. For a large room with low ceilings, modules of the correct geometric forts are selected, with almost the same length of sides. Vertical modules of the same height and width. modules of different widths and heights. Pentatech "Earth" with modules of different heights. Horizontal . Each module is mounted at a distance from the other along the horizontal axis. Such an arrangement visually increases the space of the room. Vertically . The modules are mounted at a distance from each other. 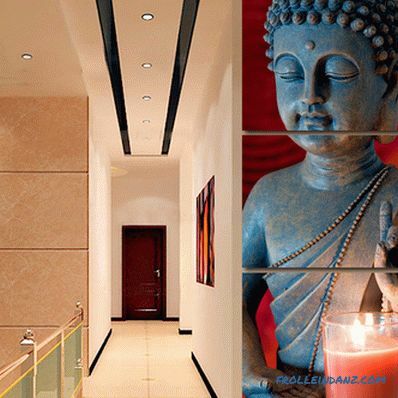 This technique is suitable for rooms with low ceilings, as it visually pulls the space. 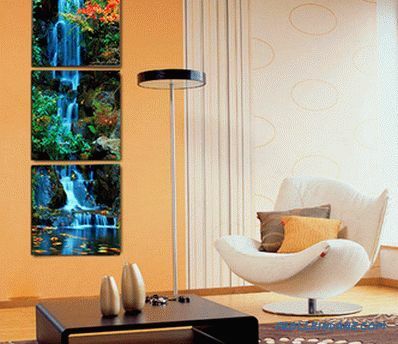 The triptych "Waterfall" creates the illusion of water falling from one module to another, making the ceilings higher. Puzzle . Modules form into a square, circle, or other accessible shape, building them like a puzzle. It is best to assemble a puzzle on a large wall, not occupied by furniture or other decor. The ladder . Most often, modules of different sizes in height are arranged in this way. If each module has its own plot, and in a single picture they are united by a style or theme, then you can post pictures at different distances from each other. If the modules are united by one picture, then they are arranged according to the drawing. 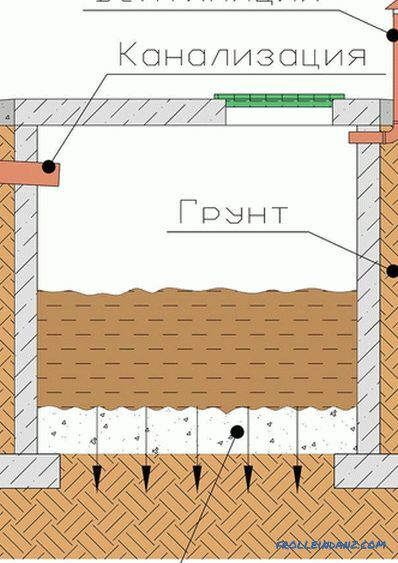 Horizontal pentatech "Autumn" is located in the ladder. A triptych is placed by a ladder. Asymmetrically . Panels of completely different size and shape are arranged arbitrarily, creating a feeling of well-organized chaos. Or maintain a horizontal or vertical axis, stringing on it pictures of different shapes, but a single theme. 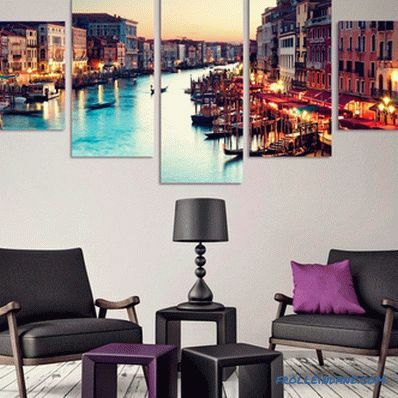 Rules for selecting the color of a modular picture If the room is made in restrained colors, and it lacks a bright color spot, choose a full-color picture.It transforms the room, makes it more alive and bright. 2. If the room is made in the style of minimalism, then the best option is a black and white image with one bright accent coinciding with the color accent of the room decoration. 3. 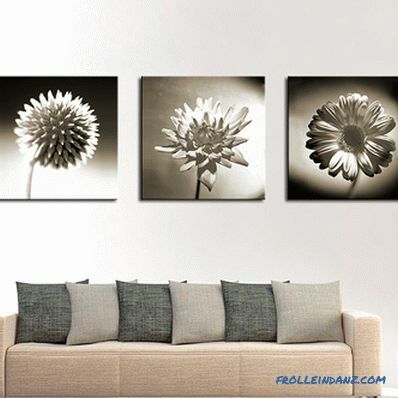 For the bedroom, monochrome images are often selected that soothe and fill with inner harmony. 4. Bold abstract full-color images are chosen for public spaces. In the bedroom, this canvas is better not to have, as it will quickly tire. 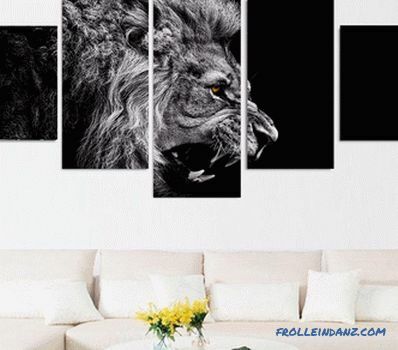 Monochrome "Lion" in the white interior. black white with a color accent. 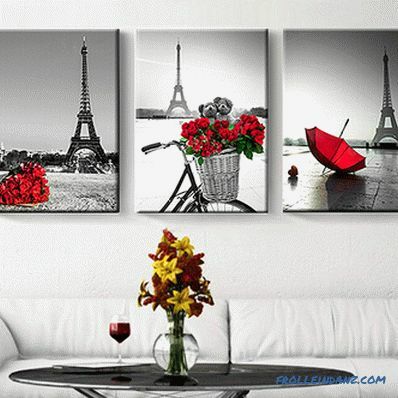 Black and white Triptych "Memories of Paris" with a red accent. 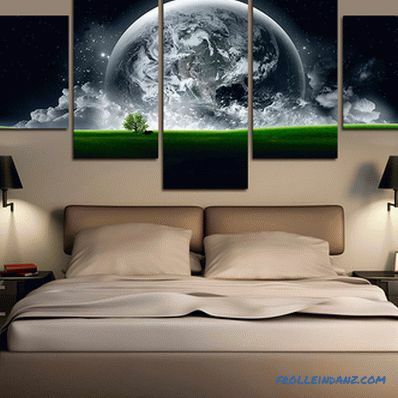 The modular pictures in the bedroom look harmonious if they are large. Not only each module, but the overall size of the canvas must be large. For example, 80 by 60 cm. 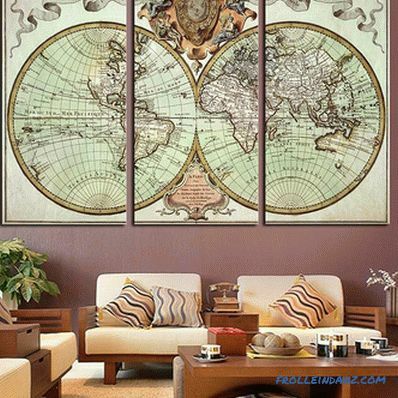 A large panel "Rising over the Sea" in the interior of a spacious living room. 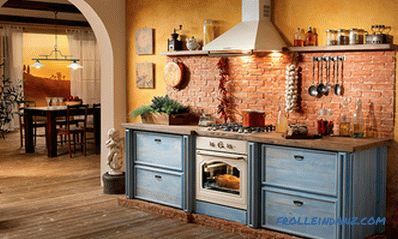 For a cozy kitchen or corridor, choose a diptych or triptych of moderate size, the modules of which are approximately 40 by 20 cm, or 40 cm by 40 cm. Square modules in the interior of the kitchen. 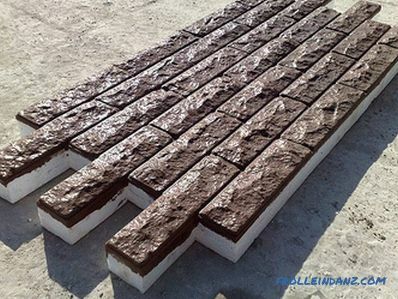 For rooms with the correct architectural data, square modules of medium size are suitable, for example, 65 cm by 65 cm. They decorate the room without overloading the interior balance. 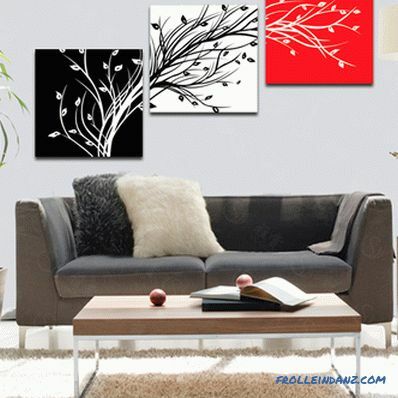 Triptych "Flowers" in the living room. 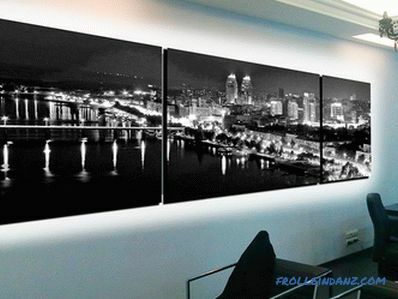 For a spacious office, battle canvases are selected; their size is 160 by 80 cm or more. 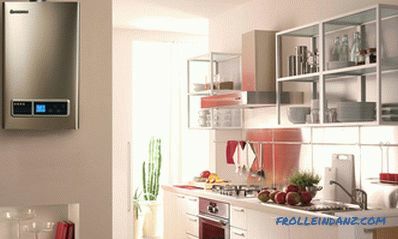 Modules effectively emphasize the status of the room, decorating it. 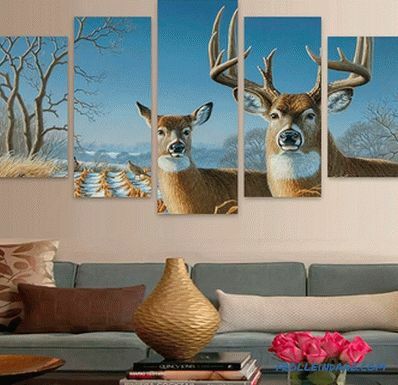 When buying segmented pictures, it is important to choose the right plot. For a child’s and an adult’s bedroom, it’s best to select a story that will be age appropriate. And for the kitchen and living room - the plot, which will correspond to the purpose of the room. The modular paintings in the living room are in full view of all households and guests, this is a business card of the interior. Well, if you can pick up a plot that will delight all family members, regardless of gender and age. For example, it may be a cityscape. It will fit well into the interior of the apartment, which is located on the high floor of a multi-storey building. 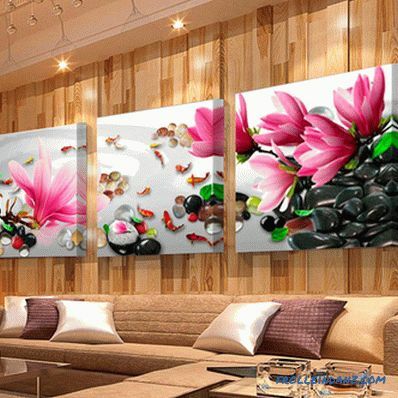 If the living room is quite spacious, it is better to choose a picture of four or more modules. Urban landscapes include architectural views of ancient cities, modern silhouettes of skyscrapers, populous streets of resorts. 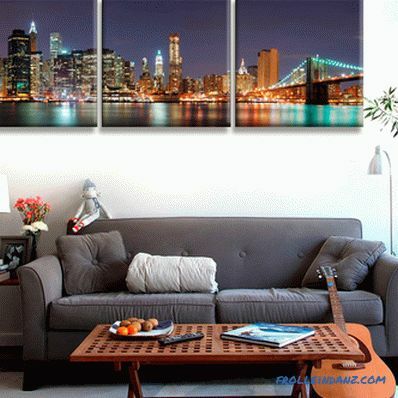 City landscape in the living room interior. 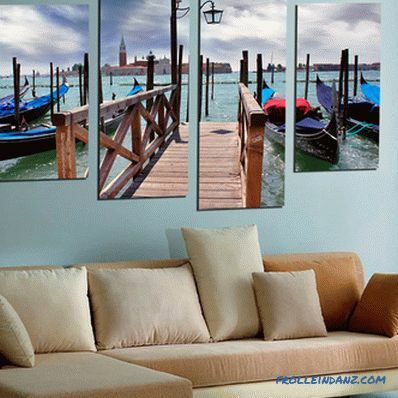 Pentatech "Venetian landscape" in the recreation area. 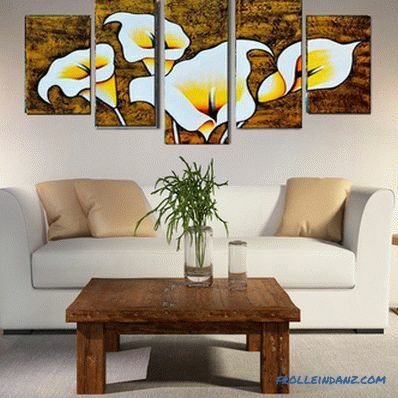 Actively use paintings with floral, vegetable or animal themes for living room decor. These are traditional plots that are performed in full color. They can represent one picture, or different, but united by one theme. Often these paintings have a hidden meaning. For example, the lotus flower symbolizes the wisdom and harmony of human relationships, the deer family - strong family ties. Natural landscapes are a good idea for the gift option. 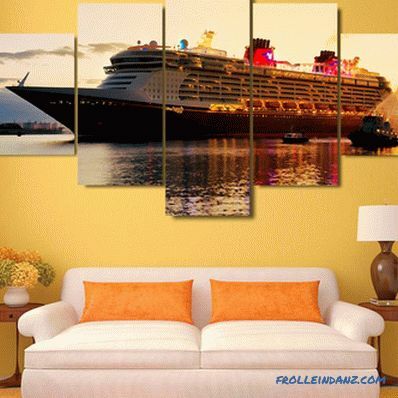 A full-color landscape will fit into any interior, so you can safely give it to a housewarming party. 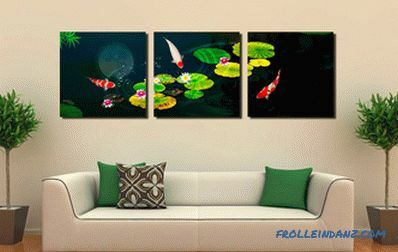 Those who are interested in Chinese philosophy and arrange objects according to the Feng Shui method should pay attention to the paintings with water, which symbolizes the movement of qi energy. 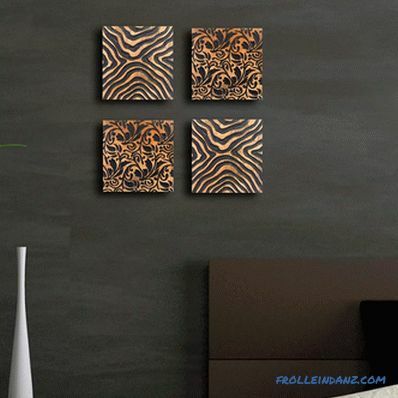 Modular paintings in the living room in the style of high-tech or minimalism allow abstraction. For modern it is better to pick up a copy of the canvas by an impressionist painter, and for an interior in ethnic style, suitable views of African, Indian nature. 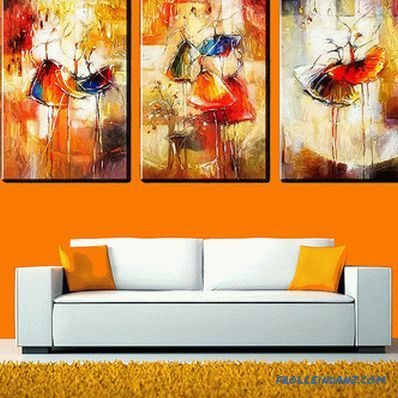 Triptych "Ballerinas" in the interior of the living room in modern style. 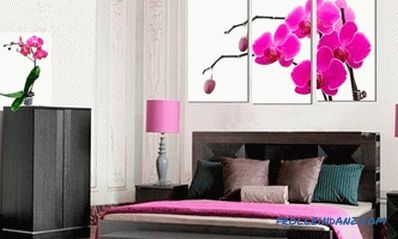 The most popular theme for the interior of the bedroom is flowers, animals and natural landscapes. Modular paintings in the interior of the bedroom should not be too bright. 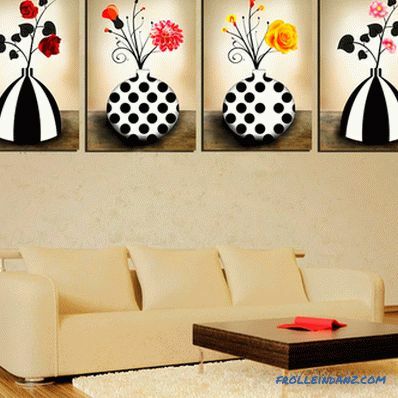 The stylish solution is black and white modules with one bright accent or without it. 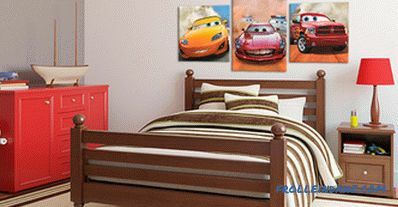 A room of a young guy or girl can be decorated with travel-themed paintings or abstract images. They emphasize the individuality of the owner of the room, will contribute to self-affirmation. But it is important that the owner was directly involved in choosing the plot of the picture. Polyptych "Cruise" in the interior of the bedroom. If the child is very small, then the theme of cartoons will undoubtedly please him.But for the student choose a topic more interesting. Pay attention to the heroes of fantasy, computer games or the birds and animals in a real genre. In a child's room, a picture is not just a part of the situation, it is part of his inner world. Therefore, the characters should be from your favorite books, games or movies, and their animals are those that really exist and like or fantastic characters. Selecting a picture with your child, you give him a sense of self-worth and understanding. 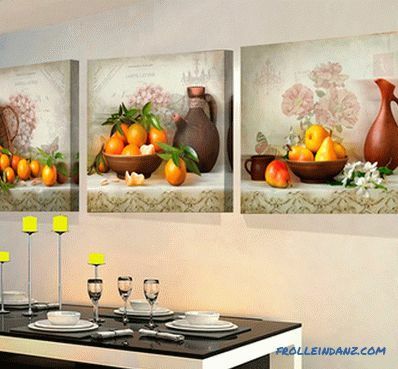 The modular pictures in the interior of the kitchen depict fruit, bread, buns and another meal. 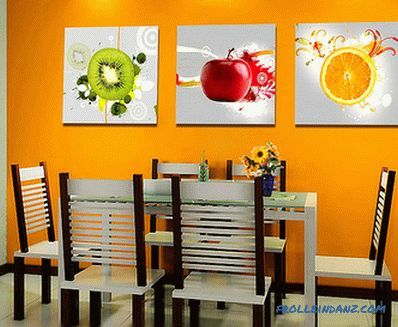 Such paintings harmoniously look in the interior, cause appetite and decorate the kitchen space. Triptych "Wine and Fruit" in the interior of the kitchen.